Eukaryotic cells are characterized by an ordered and targeted delivery of molecules between the different cellular compartments. Most of this molecular traffic is mediated by vesicles, which are small membrane-bound compartments that transport and deliver soluble and membrane molecules between the cell compartments. Vesicular trafficking is an interesting evolutionary cell achievement because it can be selected what types of molecules are transported and to what cell compartment they are targeted to. Furthermore, the physiological and molecular identity of each membrane-bound compartment of the cell is mostly determined by the molecules that arrive included in vesicles. If there were no specific delivery of vesicles there would not be cell compartments with specific molecular features. Vesicles are formed in the membrane of a source compartment (many organelles and plasma membrane can form vesicles) and loaded with molecules to be transported. Once released in the cytosol, vesicles are targeted to other compartment (again, other organelles or plasma membrane). Vesicles have first to recognize the target compartment and then fuse with it. In this way, molecules transported by vesicles will be part of the target compartment. Some these molecules stay in the target compartment as resident molecules that perform the compartment function. However, some molecules are included again in new vesicles targeted to other compartment (the target compartment is also a source compartment). It is frequent that source and target compartments are connected bidirectionally, that is, both can send and receive vesicles from each other. Vesicles sent back from the target to the source compartment have a recycling purpose. . 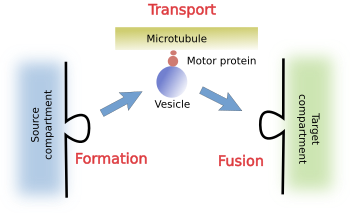 The life of a vesicle is divided in several stages: formation, transport and fusion (Figure 1). Different sets of molecules are needed for each step. Figure 1. Stages in the life of a vesicle. a) Formation. During vesicle formation, several types of proteins are needed for recognizing and fetching cargoes. Cargoes are the molecules to be specifically transported. Another additional set of proteins are involved in bending the membrane and pinching of the vesicle from the source compartment. b) Transport. Before excision from the source compartment, vesicles have to include proteins to interact with motor proteins, which are able to drag the vesicles along the cytoskeleton filaments, either microtubules or actin filaments, to the target compartment. c) Fusion. Finally, vesicles also need to bear proteins to be recognized by the proper target compartment, and to dock and get fused with it. Vesicle formation in the any source compartment is a very complex molecular process (Figure 2). There are many molecules involved in different aspects of the vesicle formation: selecting the place and starting the whole process, selecting the cargoes, bending and strangling the membrane, removing unnecessary molecules once in the cytosol, etcetera. Figure 2. Clathrin coated vesicle formation goes through several stages with different molecules involved (adapted from Weinberg and Drubin 2012). Vesicle formation is an ordered process where molecules are being recruited in a precise manner. In clathrin coated vesicles of yeast, more than 65 proteins are estimated to be involved during the vesicle formation. In mammals, 50 have being found. All these proteins are cytosolic proteins. Clathrin coated vesicles start with a local increase of the concentration of the PI(4,5)P2 phosphoinositide in the membrane of the source compartment (Figure 2). Then, it captures adaptor proteins, which in turn recruit cargoes and the clathrin coat. It has been suggested that areas of high concentration of cargoes may also trigger the nucleation of the vesicle by fetching adaptor proteins. COPII coated vesicles, however, start vesicle nucleation by the adhesion of Sar1 GTPases molecules to the membrane of the source compartment. Sar1 molecules are activated and recruit adaptor molecules for selecting and capturing cargoes, as well as the COPII coat (Figure 3). There are domains in the source compartments that facilitates the formation of vesicles. For example, COPI-coated vesicles are formed in the transitional regions of the endoplasmic reticulum. Figure 3. 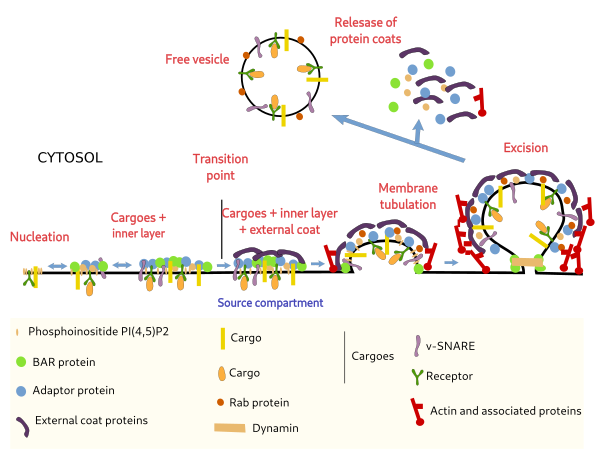 Formation of COPII coated vesicles (adapted from Budnik and Stephens, 2009). The basic components of the COPII coat are Sar1, Sec12, Sec23/24, Sec13/31, which are present from yeasts to mammals. The first step for starting a COPII vesicle is the activation of Sar1 GTP-ase by Sec12. This activation allows Sar1 to be inserted in the membrane of the endoplasmic reticulum. Activated Sar1 recruits Sec16, Sec23 y Sec24, membrane can be bent. Sec23 modulates the activity of Sar1. Sec24 is in charge of selecting the cargoes by recognizing some sequence of the cytosolic domains of the proteins. Cargoes may be transmembrane protein and soluble proteins. 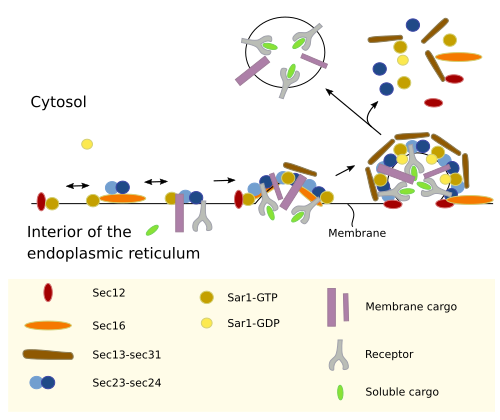 Soluble proteins have to be recognized by membrane receptors, which in turn are recognized by Sec24. All these proteins form a stable molecular complex that recruit the external component of the coat: Sec13 and Sec31. These two proteins form a geometric although flexible structure when compared with the clathrin lattice, which permits accomodate cargoes with different sizes. After the excision, the external coat is released by the hydrolysis of the GTP of Sar1. There are three ways a molecule can travel inside a vesicle: as a transmembrane protein, as a ligand linked to a receptor, and unspecifically as a soluble molecule. Adaptor proteins are able to recognize the cytosolic domain of transmembrane proteins of the vesicle membrane. Some of these transmembrane proteins are in turn receptors that recognize and link soluble cargoes that need to be transported. Another way to select proteins to be included in a vesicle is by the length of the transmembrane segment of some transmembrane proteins, so no need for adaptor proteins. The initial set of proteins (GTPases, adaptors, receptors and cargoes) forms a cluster or aggregate in the membrane. After a critical size is reached, the recruitment of more proteins is boosted, which ends with the recruitment of the external coat proteins. To reach and pass this critical size is known as transition point and it means that the vesicle will be formed. If the transition point is not passed, the molecular ensemble is desegregated and dispersed again. It appears that the number of cargoes that the initial aggregate manages to gather is important to pass the transition point. It the number of cargoes are not enough the vesicle are not formed. Among the proteins of the external coat, there are proteins in charge of "weaving" all the structure, bend the membrane, set the vesicle internal volume, facilitates the polymerization of actin filament, and "undress" the vesicle after the excision. When the amount of external coat proteins is higher enough (60 % of the total vesicle proteins in clathrin coated vesicles), the membrane starts to bend and the nascent vesicle is visible. Excision is the detachment of the vesicle from the membrane of the source compartment. Bending a membrane and pinching-off a vesicle is a complex and coordinated process requiring energy and the involvement of a wide variety of proteins. For example, there are proteins that helps with the assembling of the external coat, and at the same time are able to insert part of their amino acid sequence into the source compartment membrane. These proteins have a molecular domain, known as BAR, that works as a wedge once it is inserted in the membrane, therefore producing curvature of the membrane. Sar1 GTPases participate in the initial bend of the membrane to start a new COPII coated vesicle. In clathrin coated vesicles, polymerization of actin filaments and motor protein myosin also contribute to generate pulling forces that increase the size of the nascent vesicle, and help later during the excision step. Getting a completely free vesicle also needs the participation of dynamins, proteins that localize at the connection neck of the vesicle with the source compartment membrane and strangle this bridge. COPII coated vesicles, however, do not need actin filaments nor dynamin for vesicle excision. After the release of the vesicle, many coat proteins are detached from the vesicle surface and go back to the cytosol as soluble proteins ready for a new round of vesicle formation. In this way, the new vesicle looses many proteins from its surface and can be transported to the target compartment. Most coat proteins detach from the vesicle once it is free in the cytosol. Two mechanisms are involved: chaperones, such as HSC70, and dephosphorylation of PI(4,5)P2. HSC70 is included in the set of proteins during vesicle excision. Removing the protein coat improve the interaction of the vesicle with the cytoskeleton first, and with the membranes of the target compartment later. Mnce free in the cytosol, vesicles are uncoated and dragged to the target compartment. The forces that move the vesicles are mediated by motor proteins associated to microtubules or actin filaments. In animal cells, most of the vesicular trafficking is driven by microtubules, helped by actin filaments. In plant cells, however, actin filaments are the major responsible for vesicular movement in the cytoplasm. The mechanism for fusing th vesicle and the tarted compartment is complex (Figure 4). It has to be specific to make sure that each vesicle, with a particular set of proteins, is fused with its proper target. Open anc seal membranes are very difficult tasks because we must jump over a high termodinamic barrier. The process is accomplished in several steps. Figure 4. The vesicular fusion mechanism involves several steps before the vesicle molecules become components of the target comparment (adapted from Weinberg and Drubin 2012; Witkos and Lowe, 2017). The first step for a vesicle to know what is the compartment to fuse with is the initial recognition or tethering. It requires a label, as a postcode, in the vesicle to be recognized by the tethering complexes in the membrane of the target compartment. Tethering complexes are long proteins that work as fishing rods that can physically link the vesicle. 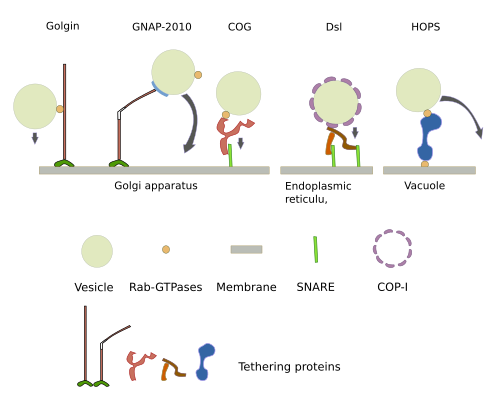 There are several types: golgins, CORVET, Dsl1, exocysto, GARP/VFT, HOPS/Class C VPS, TRAPPI y TRAPPII, which are distributed in different cell compartments (Figure 5). Tethering complexes may change between straight and bent conformation, and can reach more than 200 nm long, which means they can be very long fishing rodes. They initially capture the vesicle, hence their differential distribution are important for catching vesicle selectively. For example, cis, intermediate and trans cisterns of the Golgi harbor different tethering complexes. Figure 5. Tethering complexes are distinctly distributed in cellular compartments (adapated from Kuhlee et al., 2015). The recognition happening during tethering is necessary for the next steps. 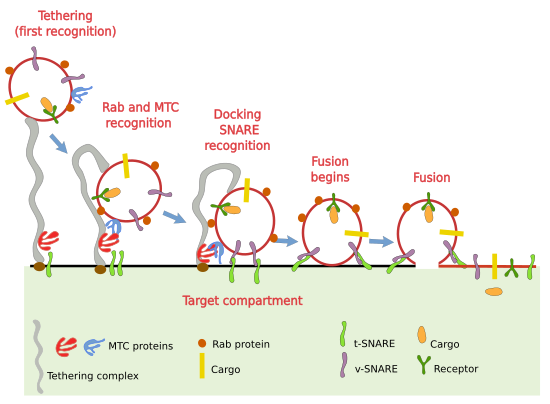 MTC (multi-tethering complex) are also involved in getting the vesicle closer to the membrane of the target compartment to make possible the recognition by SNARE proteins (Figure 4). In humans there are 37 different SNARE. They are transmembrane proteins that can be t-SNARE (t: target) and v-SNARE (v: vesicle). v-SNARE are included in the vesicle during vesicle budding and t-SNARE are in the membranes of the target compartment. The interaction between v- and t-SNARE gets the vesicle and the target compartment membrane much closer, releasing energy at the same time, which is needed for the fusion of the two membranes. SNARE proteins are another checkpoint that makes sure that the vesicle is fusing with the proper target compartment. However, other proteins are also involved in this fusion step. For example, actin filaments have also a role during the fusion of vesicles, at least during regulated exocytosis. Borgese N. Getting membrane proteins on and off the shuttle bus between the endoplasmic reticulum and the Golgi complex. Journal of cell sciences. 2016. 129: 1537-1545. Budnik A, Stephens EJ. ER exit sites – Localization and control of COPII vesicle formation. FEBS letters. 2009. 583: 3796–3803. Cai H, Reinisch K, Ferro-Novick S. Coats, tethers, Rabs, and SNAREs work together to mediate the intracellular destination of a transport vesicle. Developmental cell. 2007. 12:671-682. Kaksonen M, Roux A. Mechanisms of clathrin-mediated endocytosis. Nature reviews in mollecular cell biology. 2018. doi:10.1038/nrm.2017.132. Kuhlee A, Raunser S, Ungermann C. Functional homologies in vesicle tethering. FEBS letters. 2015. 589:2487-2497. Maldonado-Baez L, Wendland B. Endocytic adaptors: recruiters, coordinators and regulators. Trends in cell biology. 2006. 16:505-513. Martens S, McMahon H T. Mechanisms of membrane fusion: disparate players and common principles. Nature reviews in molecular cell biology. 2008. 8:543-556. Tran DT, Ten Hagen KG. Real-time insights into regulated exocytosis. Journal of cell science. 2017. 130:1355-1363. McNiven MA, Thompson HM. Vesicle formation at the plasma membrane and trans-Golgi network: the same but different. Science. 2006. 313:1591-1594. Weinberg J, Drubin DG. Clathrin-mediated endocytosis in budding yeast. Trends in cell biology. 2012. 22:1-13. Witkos TM, Lowe M. Recognition and tethering of transport vesicles at the Golgi apparatus. Current opinion in cell biology. 2017. 47:16–23.